This week on Costume Analytics we will take a trip across the Pond and look at a snazzy American fashion, depicted in Ralph Earl's 1791 portrait of Mrs. William Moseley. This is a fascinating portrait because it not only depicts a Not-French and Not-English ensemble, but because this particular redingote ties in so acutely with American Revolutionary history. The redingote, translating to "riding coat," was an outdoor garment designed to protect the wearing from the elements. They were undoubtedly made of thick wool, often with wool flannel linings, and additional interior layers to keep the wearer dry and warm. Our redingote appears to be made of navy blue wool, and is trimmed with gold piping and large, flat brass buttons. 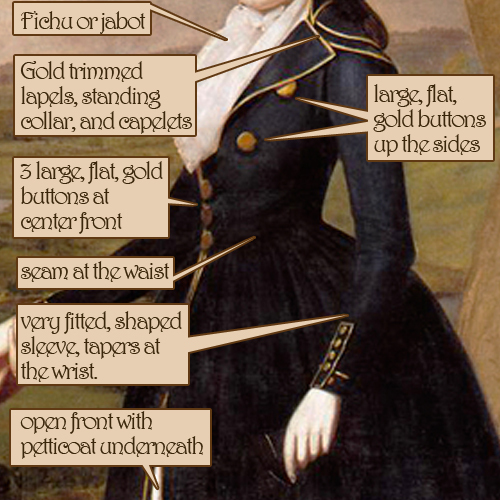 Take note of Mrs William Moseley's color choices in this portrait - she is wearing navy blue, gold, and a buff colored hat and petticoat, the colors of the Continental Army. Her son is in red, completing the trio of red, white, and blue. The curious thing is that this portrait was done in 1791, a good 15 years after the Declaration of Independence: is this American patriotism 18th century style? 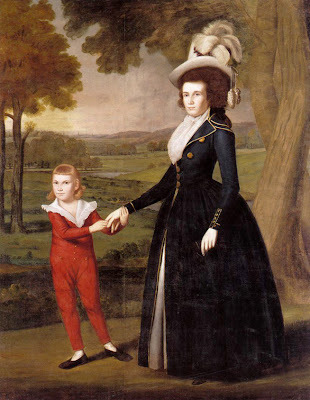 From what we can see in the painting, the bodice is tightly fitted over stays, and features a front closure that fastens edge-to-edge, with the three large buttons as non-functional decoration. The neck is rather open, and flares into lapels, topped with a standing military-style collar, and swooping back into double capelets, reminiscent of men's greatcoats. Notice the shaped and very fitted sleeves that taper at the wrists. These sleeves would have been two pieces (top and under sleeve), with functional buttons at the wrists. 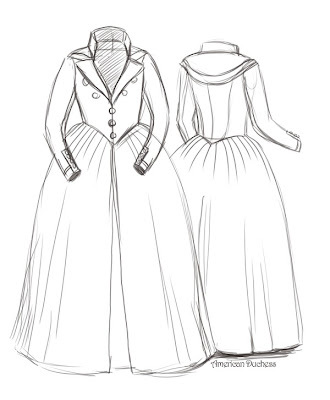 The skirt is pleated (cartridge pleats or large knife pleats) and attached to the waist, with the front left open to show the petticoat. The front edges are trimmed with the gold piping, down to the ground, but not around the hem. Also notice how the hem is above the ground, not trained as we often see in European redingote styles. 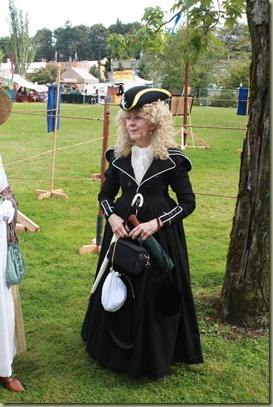 This coat-dress may have been worn not as a riding habit, but as a sort of uniform, or at the very least a travelling dress, or a walking and visiting dress. Mrs. William Moseley's redingote is worn over stays, no doubt, and massive skirt supports that would have included a bump pad and several petticoats. 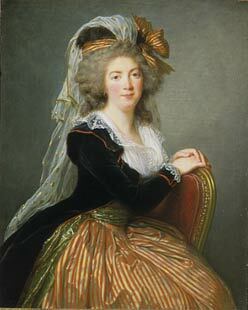 She is wearing a frothy neck scarf tucked into the front of her bodice, and bloused out. This neck scarf is wrapped around her neck several times, then tied and tucked, in the men's fashion, to protect her neck from the high standing collar of her coat. Mrs. Moseley is wearing a tall-crowned, buff colored hat that appears to be wool felt. 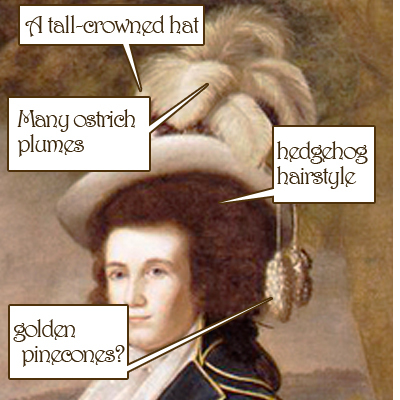 atop her hedgehog hairstyle typical of the 1790s. It is trimmed with four ostrich plumes and a curious hanging detail that appears to be two golden pinecones on ties. I'm sure this has Revolutionary significance, but I haven't a clue what that is! 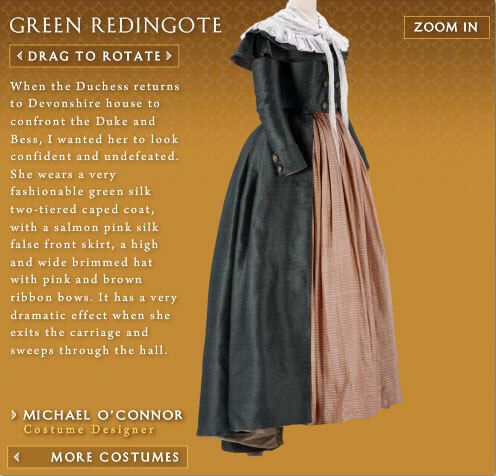 Unfortunately I haven't found a pattern for a redingote, but there are some ways to go about creating one. Extend the skirts of a riding habit full-length. When patterning, or adjusting an existing pattern, look for menswear details around the collar. You want lapels, a standing collar, a cape. The redingote can be very feminine and still use these details. You want wool - I am not an expert on wool, but look for something medium weight such as a melton. Gold piping can be hard to find - make your own using cording, a suitable metallic fabric, and a zipper foot, or go for gold braid or trim instead. You want something not-too-shiny, and with a brassy appearance. If you really want those gold pinecones, try gilding real pinecones (from the craft store) with gold paint. If you happen to have a little boy, I'm sure he would *not* appreciate being dressed in this silly little clown-like outfit. Give him a proper suit in red! And, I have to say, the poor kid's hairstyle is even worse than his outfit. Wow. Ahhh, yeah, you found Lady D's recreation! It's lovely in person. That is one of my favorite habits. You can also use velvet for a riding coat. There are quite a few 18th century examples of velvet in action for this particular garment. 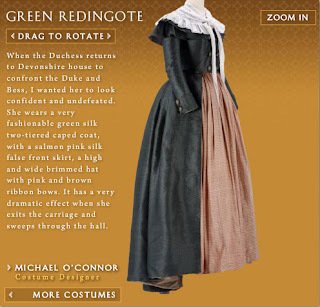 In fact that last painting may well be a velvet example:) And sometimes the bodice worn under the coat (as part of the gown itself) was boned so ladies (in the later 18th cent) with less full figures didn't have to wear the typical heavily boned (fully boned ) stays. in the later part of the 18th (revolutionary period), we see less ridged stays and a leaning toward boning in the actual garments. Keep truckin' sister, great work! sure would be fun to have the American duchess gals create a Simplicity pattern for a zone front gown or redingote.